There are three types of heat transfer that can occur and cause your van to heat up or cool down at different rates. When insulating your van, it is important to know these three types, how they work, and how you can manipulate them to make your vanlife experience more comfortable. Radiation is heat that can be transferred between two areas without any contact to the heat source; either through the air or within a vacuum. You can feel the sun’s warmth on your skin even though you are not touching it – that is radiant heat transfer. In a van, radiation occurs most prominently through the windows. If you park a car with large windows in direct sunlight, the inside of the vehicle will heat up quickly. This is because radiant heat transfers easily through glass. How can you manipulate radiant heat? Radiant heat can redirect off reflective surfaces, preventing heat from getting through. 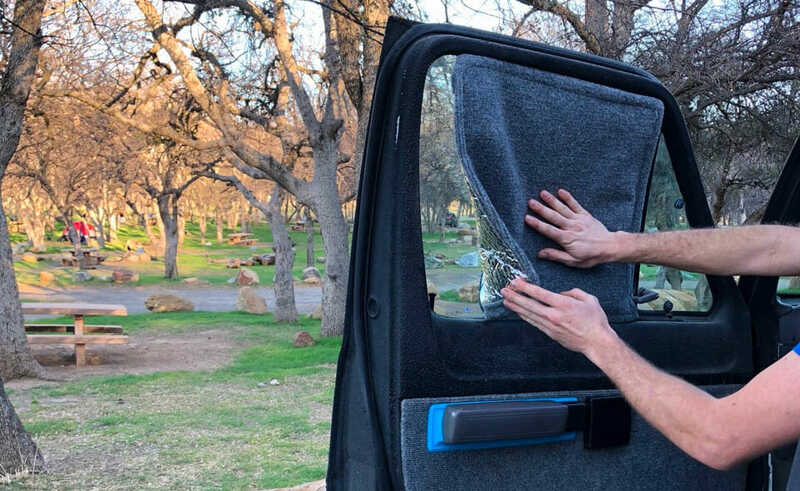 When you place a reflective sunshade on the windshield of your car, heat from the sun bounces off the shade back outwards rather than continuing into your van. There are many materials to protect against radiant heat transfer. 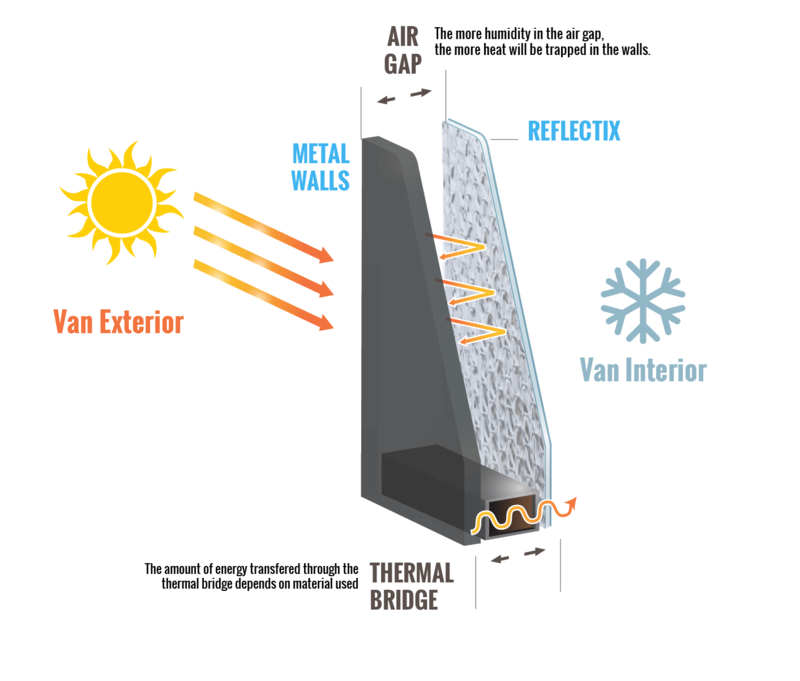 Metals like aluminum reflect heat, as well as materials like Reflectix and Infrastop. To keep your van cool, place a reflective material like Reflectix on your windows with the shiny side facing out. This way the sun’s heat will bounce off and prevent so much warmth from entering the car. To keep the van warmer during the winter months, place Reflectix on the windows with the shiny side facing in. If you are running a heater inside for example, the heat will bounce off the shiny side, and back into the vehicle rather than escaping out. Conduction occurs when heat is transferred through an object. When cooking with a cast iron skillet, you can feel the handle get hot even though that handle is not touching the fire. The metal framing of your van walls are excellent conductors of heat. Without any insulation, a van sitting directly in the sun will heat up fast. The inside metal can be hot to the touch because heat is transferred very efficiently through the outside walls. The reverse is true when it comes to cold cold. If you hold a metal bucket full of ice, it will quickly draw the heat out of your hands. If you hold a foam bucket full of ice, the heat will stay in your hands. Different materials have different levels of conduction. In general, the more porous a material is, the less it conducts heat because air is a poor conductor. Nothing resists conduction better than a vacuum; this is why vacuum insulated mugs work so well. Heat cannot transfer through a material that is not there. But it is hardly possible to create a durable, leak free vacuum in something like a van. Carpet, foam or wool are poor conductors of heat; meaning it is not easy for heat to transfer through them. A material’s heat conduction is measured by an R-Value. The higher the R-value, the harder it is for heat to transfer through a material. Aluminum has a low value of R-0.6, wool has a high value of R-3.5. R-values are measured per inch of material. One inch of wool has a value of R-3.5 and two inches of wool stacked together create a value of R-7. How can you manipulate heat conduction? Without insulation, metal cars will get cold fast in the winter because of their low R-value. To prevent a van from getting too cold inside, you can insulate the walls, ceiling and floor with materials that prevent cold air from the outside transferring to the inside of your van. Advanced Tip: If you feel like you’ve got a handle on general principles of conduction, you can use it to reduce thermal bridging. Thermal bridging is when a conductive material transfers heat through a less conductive material. An example of this is attaching insulation to the walls of your van. If you attach a layer of insulation to the walls by running a bolt through to the metal ribbing of your vehicle, heat from outside can transfer through the metal bolt to the inside. This is because both the metal bolt and metal ribbing are good heat conductors. Keep this in mind when laying out your insulation plan. Read our posts on insulating a van for cold weather, and insulating a van for hot weather to help you decide which materials to use. Convection is when heat is transferred through natural movement of liquids and gasses. This is due to liquids and gasses being different densities and temperatures. In a nutshell, hot air is less dense than cold air so it rises. In cold environments, heat can be lost through the roof of a van if it is not insulated well because hot air rises. Proper insulation of the ceiling is important compared to walls and the floor in cold weather. In hot environments, heat rises up through the floor making the van warm. Insulation on the floor and ventilation on the roof will help to keep the van cooler. Thank you that helped me, I’m catering as much info before we start a van conversion, would love to know your knowledge of vaper barriers and different types and cost. Thanks again, Donna. Hey Donna, I’m glad you’ve enjoyed our stuff so far. Vapor barriers are on our list of topics to cover so keep an eye out in the near future! I am from Romania , just bought a Peugeot Boxer, made in 2004 , to start a new job with it , and i realise that this car will be my next (and first) project to start . How can I buy your book ? Thanks a lot for building this website . We currently don’t have a book or one in the works. We are constantly adding and collecting build tips and vanlife articles that we don’t have the resources to edit it into a book at the moment. Plus, it’s all free online!